Milpitas, California, September 19, 2011 – JDSU (NASDAQ: JDSU and TSX: JDU) today announced that it will roll out a suite of optical components in the second half of 2012 critical to the build-out of next generation optical networks, also known as Self Aware Networks. 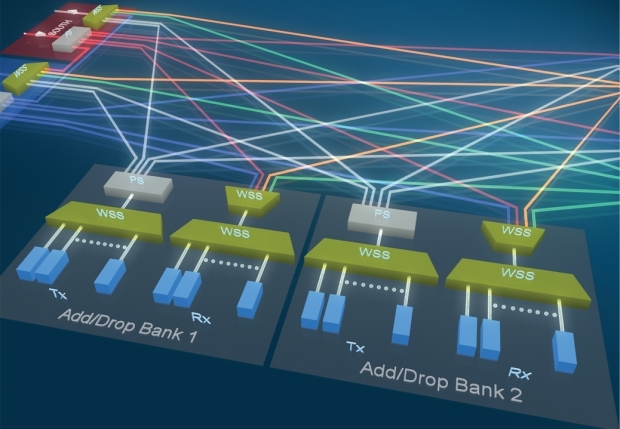 The five new optical products from JDSU are being developed based on a critical understanding of how Self Aware Networks of the future will operate. A major benefit the JDSU solutions will provide to network equipment manufacturers is the ability to design new networks that can automatically and dynamically reconfigure network traffic. Self Aware Networks are needed to support the growing volume of high-bandwidth and unpredictable traffic as people and businesses increasingly use the Internet as a key utility in their daily lives for on-demand applications such as online video. • Twin Wavelength Selective Switch (WSS) – Two independent 1x20 WSS’s integrated into a compact form factor to support the ‘route andselect’ architecture at the heart of next generation networks. It will efficiently support rapid wavelength routing, improve signal isolation and reduce the amount of optical power lost at network switching nodes. It will also provide full Flexible Spectrum channel allocation and a graceful scaling for channel multiplexing and demultiplexing with colorless, directionless and contentionless capabilities. • Dual Multi-Cast Switch – An integrated pair of new devices for Self Aware networks that implement colorless, directionless and contentionless wavelength routing in a single and highly compact and cost effective package. It will support up to 8 degrees of optical switching and 16 transceiver ports. • Optical Channel Monitor – A high speed and high resolution channel monitor that has multiple inputs and a scanning filter to support the demanding needs of Flexible Spectrum and dynamically reconfigured Self Aware Networks. • Hybrid Raman - Erbium Amplifier– An amplifier that re-energizes weakened network signals traveling overlong distances while injecting less noise onto the network compared to conventional erbium doped fiber amplifiers (EDFAs). This will allow 100G or 400G signals to travel further with less performance degradation and leverages JDSU’s leading high power optical pump and EDFA technologies. • EDFA Array – Several EDFAs integrated into a highly compact form factor will provide amplification within flexible multiplexing and demultiplexing modules. ■ Colorless Capability – Allows for the selection of any wavelength (or color) channel to carrydata along any available physical route within a network without any physical reconfiguration. ■ Directionless Capability – Allows any wavelength channel to carry data along any physicallyavailable route within a network without any physical reconfiguration. ■ Contentionless Capability – Removes the restriction that currently prevents multiple signals of the same wavelength traveling along different routes to be multiplexed and demultiplexed within the same add / drop module. ■ Flexible Spectrum – Allows wavelength channels to be provisioned with various spectral widths providing the flexibility to support data rates beyond 100G that will require additional channel bandwidth compared to what is currently provided in today’s 50GHz channels. View the JDSU optical communications portfolio at Booth #1622 during the European Conference and Exhibition on Optical Communication (ECOC) in Geneva, Switzerland from Sept. 19 – 21, 2011. Tune into a webcast about ROADMs for next generation network architectures on Sept. 27 at http://www.lightreading.com/webinar.asp?webinar_id=29753.